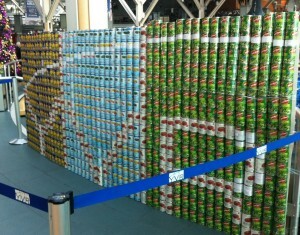 Vancouver Airport Authority's Engineering team created a can-sculpture out of 800 tin cans. On Thursday, the Vancouver Airport Authority and its partner businesses on Sea Island came together with a Christmas Food Hamper Drive in support of Quest Food Exchange. More than 450 hampers were contributed by employees of companies right across Sea Island. The hampers, each of which will include a turkey courtesy of the Vancouver Airport Authority, will benefit Quest families in need this Christmas. Just some of the 450 hampers donated. Showstoppers made sure everyone was in the Christmas spirit. Elettra Communications with Santa. 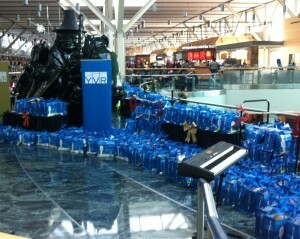 Happy to be part of the big day at YVR!